Our goal with every hamper is that it makes an impact on your recipient, we select only the finest quality basketware and gift boxes to pack our products in. We are also happy to try out new packaging options and if you have an idea for a hamper we can use our network of first-class suppliers to try and find you a unique and special choice. Our hampers are packaged in sturdy cardboard postal outers with our logo screen-printed on it to make the right impression from the very moment the doorbell rings. We use crisp white Lewis and Cooper branded tissue paper in our baskets and larger gift boxes to give the final finishing flourish. Our team lovingly handwrites every message on a traditional Lewis & Cooper branded gift tag. We feel that this adds a personal and homely touch that our clients love. You can add a message of up to 160 characters, we don’t include any invoices or delivery notes in the hamper so we recommend that you do include a message to say who it’s from. All of our perishable foods like meats and cheeses are packaged in insulated and reusable chill bags with an ice pack to ensure that they stay cool during their journey. All of our deliveries are overnight as standard and we don’t send out perishable orders on a Friday to prevent them being stuck in a warehouse over the weekend. If you have a larger order of 20 or more hampers, we would love for you to ask us about our custom branding options that will add the perfect finishing touch to your hampers. From special branded baskets and boxes to custom printed leather tags, tissue papers and ribbons we can make your hamper shout your brand. Simply provide us with your artwork and we’ll sort out the rest. 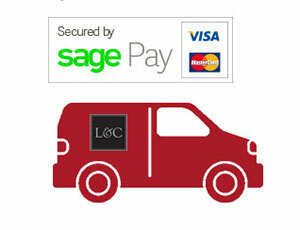 For more information on corporate and bespoke orders visit our corporate services page. 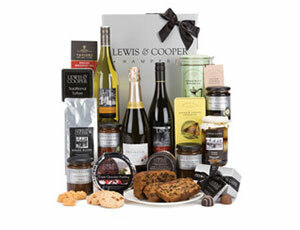 Lewis and Cooper make every attempt to use packaging that is environmentally friendly and reusable and/or recyclable. 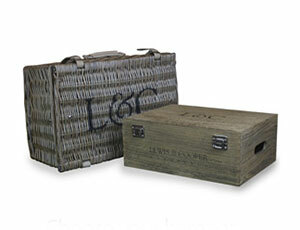 Complying with the Producer Responsibility (Packaging Waste) regulations, we offer a range of suitable packing options for your hamper, from our durable and reusable wicker picnic baskets to our gift boxes and postal cartons which contain recycled card. Most of our product packaging can be recycled through your local council collections or at local recycling centres. Please check the packaging for recycling information. Our loose fill material (the green foam pieces), that we use for cushioning our products in transit, is made from a biodegradable material and can be safely placed in the general waste bin.